The sea is always warm in Antigua, with surface temperatures never dropping below around 26 oC. From August to October water temperature rises to over 28 oC. When to go? Hurricane season is from July to November, especially from August to the middle of October. The dry season begins in January - but the island gets busier and more expensive around this time. Prices get cheaper after April, making May a good time to visit. One of the richest sites for coral and marine life in Antigua. You can only dive it in calm weather as there is no mooring and the boat needs to sit very close to the cliff. An underwater peninsular is 12 m on the shore side, 20 m on the deeper side and 5 m on the top. It then drops off again to over 25 m. Really well preserved coral as it is so seldom dived. Dived by DiveCarib. "Pinnacle dive which drops to around 130ft/40mt at the back. " "Great reef dive, topography is great. Lots of boulders that have fallen of the island, which create lots of holes for critters and morays. You always see a turtle here! " "Located underneath Eric Clapton's house. Great elk horn's and soft coral, dolphins came through too. We also saw a great spotted moray. " Pleasant, easy dive due to the abundance of fish and sheltered location. 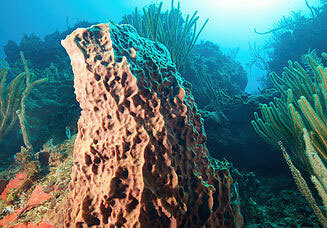 The site runs along a cliff with large boulders with coral growth and many ledges under which fish and lobster hide. It has a fun swim through. Popular choice for night divers or as a second dive. An intact wreck lying up-right on the sea floor. Penetration possible. A small dive site but full of many fishes plus lobster, turtles and nurse sharks. A plateau partially surrounded by a ledge from 12-18 m, it is full of holes, cracks and ledges. As it's off a headland it is often rough so not always diveable. Best done in calm weather by experienced divers as a drift dive. The cliffs below Shirley Heights continues underwater ending in many large boulders. Depths of 30 m can be reached just 15 m away from the shore. 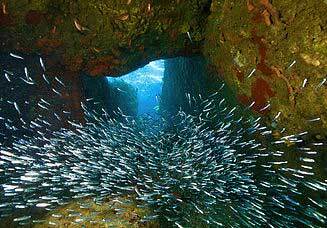 There is also a shallow but wide cave often full of tarpon. All divers need to be advanced with good air consumption for this dive. Antigua's only independent 5 star PADI facility. The owners, Leigh and Bryan each have over 20 years experience as instructors in the dive industry. PADI Courses, Tec diving and yacht services available. "Cptn Paul is the "old salt" of diving in Antigua. He is low key, but knows dives sites since the 70"s. If you want the best, go with Paul, Ron and Katerina"
Please send us your comments on Antigua. Do you want to recommend a diving centre or dive site? Let us know.